Cool Careers: What's it like to be an aquarium scuba diver? Cool Careers: What's it like to be an aquarium scuba diver? Cool Careers: What’s it like to be an aquarium scuba diver? Josh Laabs dives in one of the Shedd Aquarium's marine habitats. This month, meet Josh Laabs! 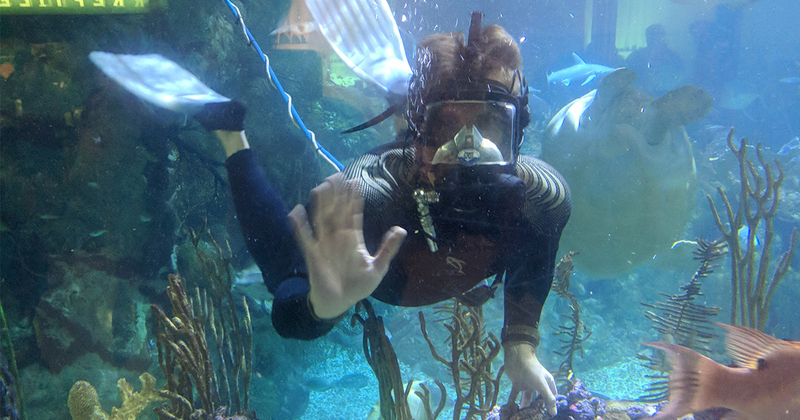 Josh serves as a volunteer scuba diver at the John G. Shedd Aquarium, caring for the animals in the Caribbean Reef, Wild Reef, and Great Lakes habitats. Josh is a freelance visual creative, with 10+ years experience in marketing, advertising and photography. He provides services in the areas of User Experience (UX) and web design, photography, videography. Josh has always had a passion for the aquatic world and nature in general, and in the past 5 years he’s deepened his involvement in those areas with a number of non-profit organizations. He’s a certified NAUI scuba instructor and board member at Learn Scuba Chicago (LSC), one of the only non-profit dive shops in the country. LSC has a passion for working with youth in underserved communities, veterans and the disabled. Additionally, he is the Creative Director at the non-profit startup, After 3 Productions. After 3 is a media company that provides unique and educational media experiences, like photography, videography and 360 visual tours. Every year Shedd Aquarium welcomes 2 million guests for unforgettable encounters with 32,000 animals from the world’s aquatic environments. But Shedd is more than a destination. Our scientists are saving endangered species and their habitats. Our animal care experts rescue and rehabilitate wildlife in need, across the country and around the world. Our conservationists are restoring the health of the Great Lakes. Our building operators are setting the standard for conserving water and energy. And our educators spark compassion, curiosity and conservation for the aquatic animal world. We are recognized within our profession with accreditation by the Association of Zoos and Aquariums, formal affiliation with the Smithsonian Institution and certification by American Humane. And all our efforts have been directed toward achieving a world thriving with aquatic life, sustained by people who love, understand and protect it.